Feeling unable to act, campaign and budget free of interference from their institutions, unions fear they will be unable to fulfil their mandate to students. In response to “ever-increasing encroachments” on their independence from institutions and a feeling of being unable to act, campaign and budget freely, students’ unions across Ireland are in the early stages of attempting to legislate to ensure their autonomy. While many students’ unions maintain a mutually agreed system of independence from their institutions, several are not considered autonomous, and thus have to justify expenses. Others, because of an undefined relationship with their institution, find that their independence is being eroded. As such, momentum is now growing for a national campaign that would leave students’ unions answerable to the students they represent, and not the institutions they work with. Unions from around the country have already come together to meet with legal representation to begin the process of drafting legislation, which would see institutions unable to threaten students’ unions with actions like withholding funding, preventing them from hosting certain events or campaigning on particular issues. Speaking to The University Times, Richard Hammond, of Hammond Good Solicitors, who also serves as the lawyer for the Union of Students in Ireland (USI) and represents a number of students’ unions around Ireland, stated that a group of unions was making “very preliminary progress” and had taken advice from a barrister. Hammond stated that “whilst we are at a very early stage in the process, I would nonetheless expect it to be something that does go ahead”, citing the ongoing issues of interference from institutions that unions are facing. 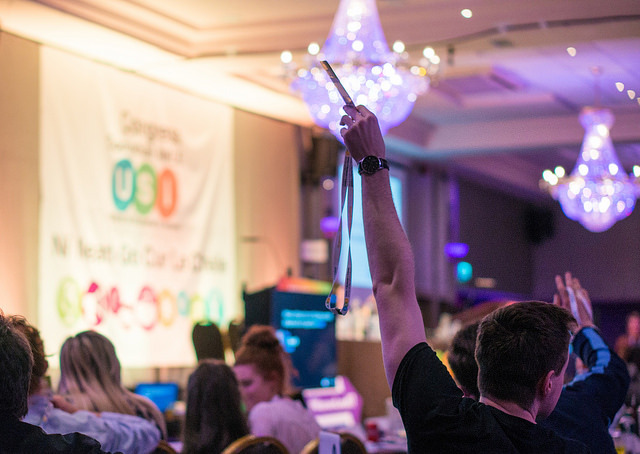 Two motions formalising USI’s commitment to ensuring the autonomy of its member institutions were passed at its national congress last week in Ennis, Co Clare, at which over 350,000 students from the island of Ireland, including Northern Ireland, were represented. In a demonstration of how pressing unions perceive the issue to now be, one motion saw the commitment added into the national union’s constitution for the first time, inserting the wording that “USI shall defend the right of students’ unions to be autonomous, democratic, student-led organisations, independent of all external authorities, with decision-making being made at the level closest to students as possible”. The issue of students’ unions’ autonomy was thrust into the national spotlight in July 2016 when Dublin Institute of Technology Students’ Union (DITSU) was left without its usual summer funding after rejecting an “unacceptable” funding proposal put forward by DIT that would have allowed the college to internally audit the union. Speaking to The University Times at the time, DITSU President, Boni Odoemene, stated that the wording was something the union “could not accept” and that the new auditing structure “has never happened before” and “goes completely against our independence”. A DIT statement provided to The University Times emphasised that “DIT is committed to supporting the full independence of our Students’ Union”. Indeed, speaking in Ennis, President of Maynooth University Students’ Union (MSU), Dillon Grace, stated that unions are now seeing “subtle but ever-increasing encroachments on our freedoms that have not gone unnoticed, and the [higher education institutions] need to be put back in check”. Speaking to The University Times, Grace stated that the union has faced issues with getting its promised funding. Three weeks ago, the union hadn’t received several months of funding, which Grace described as the “first time it ever happened that severely for us”. Maynooth University did not respond to a request for comment. Noting the “good, co-operative” relationship the union tries to have with the college, Grace states that they are trying to formalise an “understanding relationship”. Referencing the meeting of unions in Maynooth, he stated that the groups had a “good discussion on what we mean around independence or autonomy” and that “it’s now time to go back and figure out what is it that we’re going to do. I think it’s now time to come back to that to see if we can come up with that framework”. President-elect of USI, Michael Kerrigan, ran on the platform of ensuring the autonomy of students’ unions. Speaking to The University Times after congress, he stated how the union is “trying to see exactly how bad it is” by continuing to collect data and “analysing it over time to see if it’s getting worse”. Highlighting the main issues as being internal audits by colleges and unions having their constitutional changes ratified by their governing bodies, he stated that the union “wants to find out as well where there are good examples of autonomy and try to replicate those”. Some of the country’s smallest institutions are facing the same issues. Speaking to The University Times, Alice Hartigan, President of the Institute of Art, Design and Technology Students’ Union (IADTSU),which represents just under 2,500 students, stated that, with the union’s funding coming directly from the finance department of the College, “we are not independent at all”. “Any time I want funding, I fill out a form of ‘this is how much I need’ or ‘this is how much I have left’ and I have to get it signed off.” This process involves going through the College’s student experience manager, a human resources representative and multiple people in the finance department. The union also presents an annual budget to the College, “which again is another step of opening ourselves up to questions of ‘why do you need this much’ or ‘why is this down as this’”. Hartigan states that the ideal situation would be to “be able to self govern without having to present and justify our budgets to members or staff of the College”. Some unions, such as Carlow College Students’ Union and Institute of Technology Tralee Students’ Union (IT Tralee Students’ Union), are governed by a staff member of the college. “I’m the first president in six or seven years to go for a second term and that’s because every president up until now has felt that they can’t make any change because of the college administration and they just feel so stressed and feel so defeated by it”, Clarke stated. Steve Clifford, President of IT Tralee Students’ Union, is contracted by the college, and therefore is treated by an employee of the college. He describes his position in the college as “very unclear, very ambiguous, [I] don’t know what it means”, Clifford told The University Times. In order to get funding from the college for something not included in their previously approved budget, “I have to justify what I need, clarify exactly what it’s going to be spent on, how they’re going to give us the money or how they’re going to give us the information”. In contrast, some unions, including Trinity College Dublin Students’ Union (TCDSU), do not face such issues. In response to questions from The University Times by email, Kieran McNulty, President of TCDSU, stated that the union is fully independent, and that the College’s capitation model means “College does not provide us with any money. It comes from students”. “We are autonomous in the sense that I do not represent the College, and can email my members”, McNulty stated. The union does not justify expenses to the College, and the College cannot stop TCDSU from campaigning on a particular issue, bar breaches of regulations such as health and safety. As unions work together to think about legislation, Hammond stated that the different experiences of unions means that no international model of legislation would be likely to work as a model for Ireland, meaning that there is “no real country you can copy”.